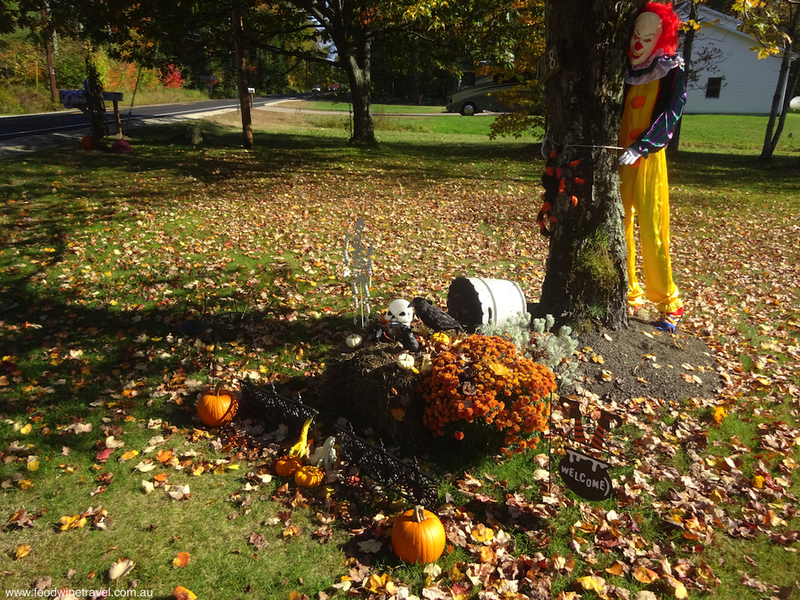 You could be forgiven for thinking Halloween is an American tradition. At the end of a country lane in Ireland, Oweynagat, the Cave of the Cats, is the entrance to another world … a world of werewolves and monstrous creatures including terrifying cats, rampaging pigs and malevolent birds. Described in medieval texts as the “hell-mouth of Ireland”, this is one of the most important sites in Celtic mythology but one of the least visited. 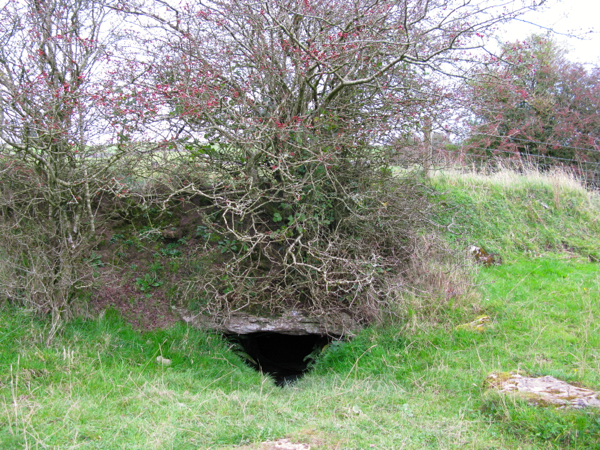 Located on a privately owned farm full of brambles and cowpats, this unremarkable looking cave is almost hidden from view. 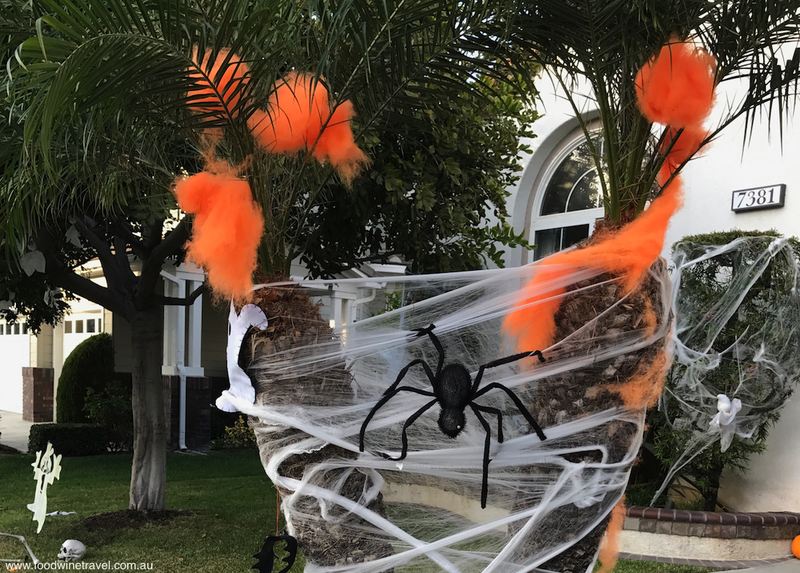 Yet it is in this spot that Halloween was born. Oweynagat, the Cave of the Cats, is the entrance to another world. 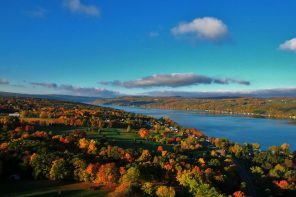 Although you could be forgiven for thinking Halloween is an American tradition, it has its roots in the Celtic festival of Samhain, which marked the end of the summer harvest and the beginning of the dark cold winter. The Celts believed that at sundown on October 31, the border between the worlds of the living and the dead became blurred, allowing spirits (both harmless and harmful) to pass through. 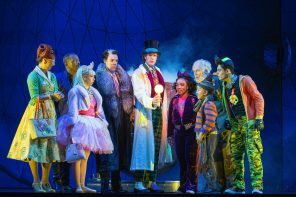 All the goblins, monsters and werewolves that were normally trapped in the other world came out on this one night of the year. We would never have found Oweynagat or learnt its fascinating story had it not been for Bernadette D’Alton, a guide at the Rathcroghan Visitor Centre in the village of Tusk in county Roscommon. With an archaeology degree under her belt and now studying history, D’Alton is a gifted storyteller who had us enthralled with the story of Meave, Earth Goddess and Warrior Queen of ancient Ireland. The fierce, proud Medb (or Meave) was responsible for launching the cattle raid of Cooley, as recounted in one of the greatest works of early Irish literature, the Táin Bó Cuailnge. Cruachan was the seat of royalty in the west of Ireland for nearly 2,000 years. Oweynagat is part of the great archaeological complex of Rathcroghan, or Cruachan as it was known in ancient times when it was the capital of the province of Connacht. 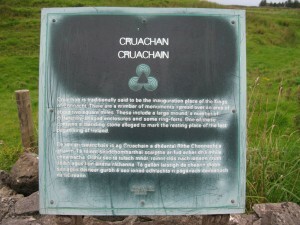 The seat of royalty in the west of Ireland for nearly 2,000 years, Cruachan was not only the home of Medb (or Meave) but an important burial ground and a place of assembly that hosted ritual gatherings. It is the largest Celtic royal complex in Europe and certainly the best preserved, since it is largely unexcavated. There are old rusty signs to the sites; some of the signs have disappeared completely. Yet the sites and stories that are told here are as old as Newgrange and as important as Tara, two of Ireland’s better known attractions. Armed with a map and some sketchy directions from D’Alton, we sought out some of the most important sites. Some, such as the Rathcroghan mound, Relignaree (Relig na Rí), the burial ground of the kings, and Daithí’s Stone, where the last pagan king of Ireland is reputedly buried, are on private property so you might need to tread carefully if you’re touring here. The entrance to Oweynagat was apparently more conspicuous before a road was built above it in the 1930s. These days, it’s a small hole under a stone slab covered with long grass and shrubs, an opening just big enough to squeeze your body through if you were brave enough. It leads to a short souterrain, about a metre high and not much wider, where there are two 6th century ogham stones, one of them inscribed with the words “(the stone) of Fraoch, son of Medb”. A steep drop-off and a second passage at right angles leads to a narrow but high natural limestone cave extending for about 50m – in total darkness, chilly, deathly silent and with water dripping from the ceiling onto the muddy floor below. Spooky. 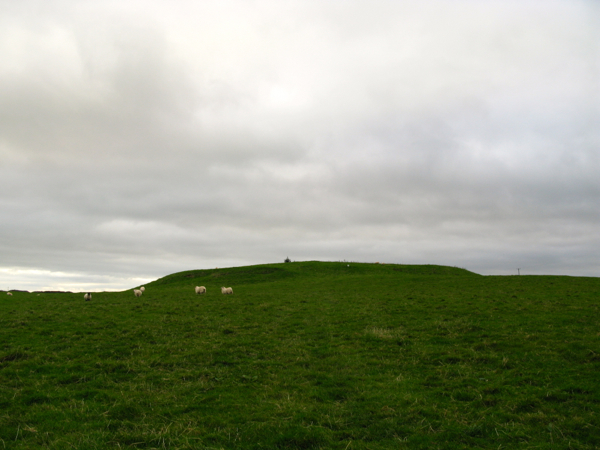 Oweynagat lies south-west of the main site, Rathcroghan, a 90-metre wide mound housing a royal tomb dating from 3500 BC. If it were excavated, it would be found to have a western entrance that picks up the light at sunset in summer, similar to Newgrange which picks up a shaft of light at sunrise on the winter solstice. Rathcroghan Mound houses a royal tomb dating from 3500 BC. 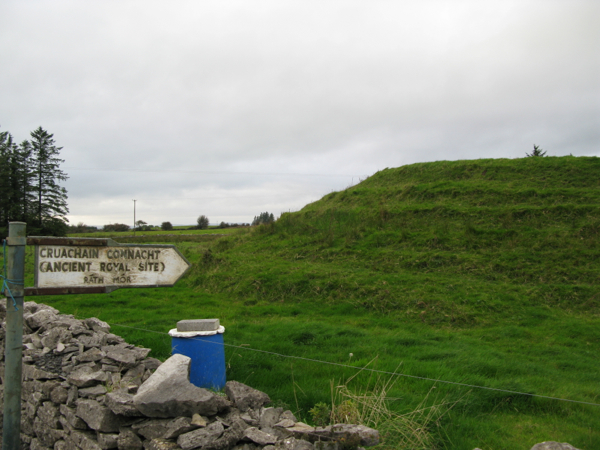 Northwest of Rathcroghan is the circular, 30-metre wide Rathmore (Rath Mór, “big fort”), which according to D’Alton, was originally thought to be a palace but is now thought to have been a feasting hall. Driving around this sleepy rural corner of Ireland, you would never guess that this is one of the most important archaeological sites in Ireland, if not all of Europe. There are few tourists around, and you have to use a lot of imagination to picture what might have been. The Rathcroghan Visitor Centre is a great starting point with a fascinating array of artefacts, text, dioramas and video presentations. It is surely no coincidence that this marvellous centre opened on October 31 in 1999. Where? Tulsk, Co Roscommon, Ireland, 18km from downtown Roscommon (no public transport). Tulsk village is near the intersection of the N5 (Dublin-Westport) and N61 (Boyle-Roscommon) roads. Great story Christine. I’d love to explore some Celtic sites and this gets the imagination flowing.